Family separation is almost universal among the refugees in our community. 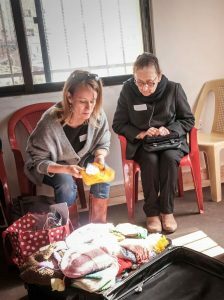 When we talk to our beneficiaries, it’s not uncommon to hear that one son is in Turkey, another is in Lebanon, a daughter has been resettled to Australia, a sister is with her husband in Austria, and the mother is still in Iraq or Syria. Though most families hope for resettlement, they know that it is rarely a solution to the fracturing of their families. Hoda attending a workshop at CRP. Every day, Hoda talks to her children, either over the phone or through social media. “Every day, even the one in America we talk to every day,” she says. Though phone calls and Facebook messages don’t compare to spending time in person, Hoda is still glad to be able to maintain daily contact with her family. Back in January, Hoda was originally looking forward to being resettled to the United States. 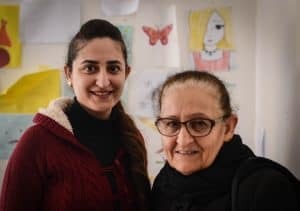 She, her husband, and her two daughters in Jordan had their final resettlement interview scheduled when President Donald Trump issued his executive order on refugees and immigration. At the time, Hoda expressed her fear and uncertainty over her family’s future. Now, her interview has been rescheduled and Hoda is hoping that she will finally be able to join her son in Michigan. “We fled, we presented ourselves to the UN. The biggest thing about the U.S. is that our son is there. We thought it would be faster, but it’s taken a long time,” she says. Though Hoda will hopefully reunite with her son, her married son and daughter are still in Iraq. The resettlement process is still stalled for many families hoping to travel to the United States as a result of President Trump’s executive orders, and many other families have not moved forward with the resettlement process for any country. In the meanwhile, families use WhatsApp, Facebook, and Facetime to communicate with loved ones from afar, hoping for a day when they will be able to talk in person. Next articleOur Computer Lab Is Up and Running!